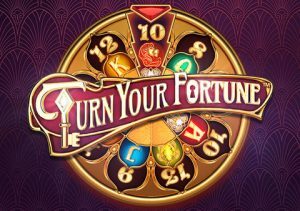 Scandi developer NetEnt has come up with something a little different in Turn Your Fortune. Central to this 5 reel, 20 payline video slot is the Fortune Ladder which comes into life during the re-spin and free spin rounds to offer awards of up 200 or 2,000 times your bet respectively. Play on your PC, tablet or mobile from between 20p and £200 per spin. There’s a luxurious, art nouveau look to Turn Your Fortune. Joining the lower value royal values are 5 higher value animal jewellery symbols. The most rewarding of these is the pink lion which awards 2, 5 or 10 times your bet for a 3, 4 or 5 symbol combination. Alongside the main reel set is a tower – this is the Fortune Ladder. It becomes active when the re-spin and free spin rounds are triggered. Fortune Re-Spins feature – land 2 scatters plus a standard win on the same spin to activate the re-spins round. The symbol from the winning combination on the triggering spin becomes the collectible symbol. The reels will then spin again, this time featuring just key and collectible symbols. If you land 5 collectible symbols, you’ll move 1 step up the Fortune Ladder. A key takes you to the next level of the Fortune Ladder where bigger rewards are on offer. The re-spins keep on coming as long as a key or collectible symbol arrive or you’ve amassed 20 symbols. You could win a prize of up to 200 times your bet here. Free Spins feature – land 3 scatters on the same spin and you’ll trigger the feature. First spin the bonus wheel. This will determine how many free spins you’ll receive (between 7 and 13), which symbol will be the collectible symbol and which level of the Fortune Wins Ladder you’ll start from. When a collectible symbol lands, it’s put in a meter. After you’ve amassed 20, you move 1 step up the Fortune Ladder. Look out for the +10 symbol. This does just what you’d expect, filling the meter with 10 collectible symbols. Extra free spins are added every time a scatter hits. Work your way all the way through the levels and you could win a prize of 2,000 times your total bet! The Fortune Ladder element of this game is a little unusual and takes a little getting used to. We’d suggest a few spins in play mode until you’ve got used to it. Once you have there’s plenty to like. The design is as impressive as usual and the re-spins and free spins rounds can deliver some pretty solid action. If you’re looking for a video slot that offers a break from the norm, then you’ll find that in Turn Your Fortune. Alternatively, Jumanji and Vikings from NetEnt offer lots of bonus features with familiar themes.